Elephant interactions in tourism is a very complex and emotional topic. Like you, we share your concerns for the welfare of elephants. Our view is that all elephants are large, wild animals and belong in the wild. There is no such thing as an ethical or perfect elephant camp. We would prefer not to but we do sell elephant tours. We are a major player in tourism in Luang Prabang and we have a voice and influence on elephant camps. We work with carefully selected elephant camps, who are not perfect but do listen to us. These camps are open to change and are actively implementing better conditions and care for their elephants. If we stopped our support for these camps, we would lose our leverage over them. We continue to work with selected elephant camps who are making positive changes and hope that other camps will stop exploiting their elephants and step up their game or eventually cease to exist. We hope this information clarifies our position on the use of elephants in the tourism industry. We have considered stopping working altogether with elephant camps and we would absolutely do so if the argument was compelling. Elephants are wild creatures. Elephants are intelligent and need large open spaces to roam. There is no such thing as a domesticated elephant. Presently, the people at Tiger Trail Travel, who love elephants and have a deep understanding of the large and complex issues, feel that our present tactics are more effective than to boycott the industry altogether. All elephants in use in Laos have sadly already been bred and broken for logging. Logging is illegal but, unfortunately, it still continues. These elephants spend long hours pulling massive trees from deep in the jungle. It is a very brutal and cruel life. 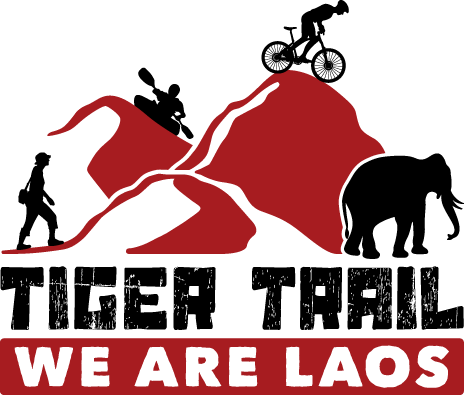 Camps in Laos obtain their elephants by rescuing them from logging. Elephants do have a better life in camps than in logging however not all camps treat and care for their elephants the same. Elephants are expensive to keep and these camps need tourists for the income required for food and other expenses. We support camps that are changing for the better and we try to make the best of a bad situation. If we don't support these camps, then these camps could not afford the food and healthcare (including professional vets and medicines) that elephants need. There would, in turn, be fewer elephants rescued from logging. Our tour costs are a little higher than the less ethical operators because we support camps that provide the necessary standard of care and this costs money. Some other camps abuse their elephants by pushing large numbers of tourists through on rides and offer tours at cheap rates. We absolutely do not support these camps. As a large operator, we can direct tourists to the more ‘ethical’ camps and in turn support them and hopefully make the numerous other camps you could choose from improve. If you wish to support an elephant camp that provides better conditions and care, you can opt for an experience where you interact with the elephants without riding. Some operators still provide riding but limit it to short periods which is not harmful to the elephant. It is better to ride on the elephant’s neck (behind the ears) and not on a trekking chair (howdah) which goes on the elephant’s back. The Elephant Conservation Centre (ECC) goes a step further. They are focusing on breeding and therefore do not want this valuable time used for riding or bathing. Their efforts are on breeding and socialization. Data shows that the reproduction rate for elephants is extremely low. With only 33 cows under the age of 20 (the country’s ‘breeding reservoir’ in 15 years’ time), the future of Laos’s domesticated elephants is under threat. ECC believes there is, therefore, an urgent need to safeguard the remaining elephants and create a breeding programme for them if Laos wants to maintain a self-perpetuating population and avoid extinction of its elephants, the number of births must increase dramatically. We also support their programme with our tours. Tiger Trail Travel as a sustainable company not only cares about elephants and other animals, we have a strong presence in working with local Laos communities and supporting local culture through our Fairtrek team. "Fair Trek | Tourism benefiting communities". Please contact David Allan, Short Tours Manager, Tiger Trail Travel or visit our local sales office for further information.